Can The UN Save London Boozers? 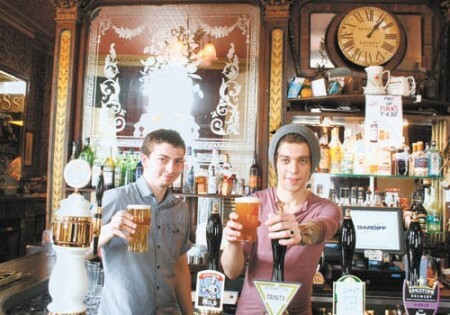 The traditional London pub has long been a cultural institution, but every week one closes. Cheap supermarket beer, wine bars and the economic downturn are all being blamed, but the real fault lies with the chain breweries who don’t look after their properties and rapacious developers. They’re perfect for snapping up and flogging off as flats. But they have a unique position in our cultural life, and their function rooms host everything from community groups and wedding receptions to wakes and reading societies. Now there’s a bid by a group of architectural students to get London pubs granted world heritage status from Unesco. This isn’t as crazy as it sounds; Viennese coffee houses are listed, as are Berlin modernist housing estates. These are ‘intangible heritage’ spots that improve life simply by being there. 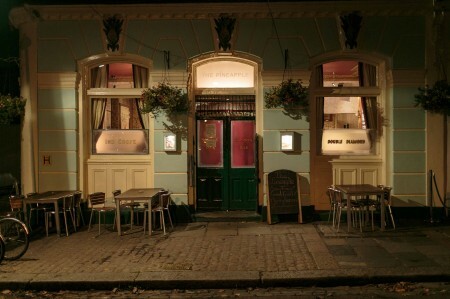 The photograph above shows the pub that was my neighbourhood local for 25 years, The Pineapple in Kentish Town, managed by one of my best friends, Simon Rennie. In its upstairs room and in its garden I’ve had countless parties. When my business partner died, this is where we held his wake. It’s the spot where the real-life Maggie Armitage accidentally knocked Ewan McGregor off his crutches. Where I used to run my reading society ‘Big Words’. Where Lionel Shriver and Augustin Burroughs first came to read extracts from their new novels. Where the Easter Bonnet Parade and Ascot outings have been arranged for the best part of a hundred years. Where Jon Snow, James Cordon, Jude Law and Jamie Oliver have all been found at the bar along with pissed-up locals and one 94 year-old lady who left on the dot of 11:00pm because she was ‘going on somewhere a bit wilder’. The pub was saved after an extensive local campaign fought off property developers, and managed to get the Victorian bar listed so that they couldn’t rip it out. But often the planning proposals are slipped in quietly and approved before anyone can lodge a complaint. My nearest pub, ‘The Crimea’, was built to commemorate the Crimean War, and all the streets around it were named after generals and battles. But locals were too late to stop its ruination. Now it’s block of flats. So why not get heritage status for the rambunctious melting pot of the London pub? Each has its own unique history. Once they’re gone and the licences are revoked, they’ll never return, and we’ll have nothing in their place except more poorly adapted singles’ apartments. One of my favourite ‘pub moments on film is in ‘Sparrows Can’t Sing’, where a fight erupts that trashes the pub. After, on the way out, one old dear turns to another and says, ‘Well, that was a good night.’ Or as Viz succinctly put it on T-shirts; ‘A pint and a fight, it’s a great British night.’ Amen to that. I was in there a couple of weeks ago and was served by the geezer in the hat there. He gave me something of a queer look, which I thought was a bit cheeky, given the headwear. The Pineapple was three minutes from my old home on Montpelier Grove! Come to think of it it’s one of Peter Grant’s dad’s locals. The Pineapple seems to be the Kevin Bacon of pubs. I’m sure he’s a lovely boy, but tw*t in a hat is the phrase that jumps into my head . . .
To be fair I’ve only ever been glassed in my small hometown, but I was punched at a bus stop here once. Hummm…. I’m not at all excited by the thought of a Pub Punch Ups, but Glassing sounds quite the evening ended. A bit, perhaps, like the Beer Bottle Shave. I don’t frequent pubs with that sort of rep. Well, that leaves out most of the British Isles, doesn’t it? Once upon a time (this is now a fairy story) there were pubs with pianos that, should you (as a drummer) wander in with a keyboard guy and a bass player and mention to the landlord that if you came in Thursday you’d bring your friends and guarantee them a full bar, they’d make you more than welcome. Then the nasty Baron Hardup decided that more than two musicians was more than Health, Safety and the Economy could bear and told the nice landlord he’d have to pay a fortune for permission to let three musos loose and lo, no more would free music embrace the land.